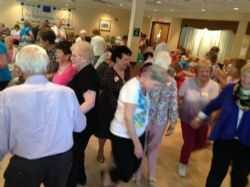 A wonderful day was had at the ICCNE at Canton this past week where John Connors & The Irish Express kept us all swinging around the dance floor. A big thanks to the wonderful caterers from the Boyne in Brighton, Kathleen and Conor kept our tummies happy and we look forward to seeing them again. As usual our team of volunteers ensured the afternoon ran smoothly, they’re a great bunch of merry men and women and finally huge thanks goes to the ICCNE and all their staff for allowing us to use their space and being such gracious hosts! So the sun is finally out in Boston and it’s making us itch to get out and about. I do understand however that some of need a little motivation to move. Hearing about this 80 year old, may just inspire us to get up and go! Yuichiro, an 80 year old Japanese mountaineer, has begun his ascent of Mount Everest in a bid to become the oldest man to reach the roof of the world. In a voice message recorded on his website, Yuichiro Miura said the expedition was setting off yesterday for a climb that was expected to take a little over a week. Miura is trying to get back a Guinness World Record that he first held in 2003 when he became the oldest man to climb Everest. That record was beaten in 2007 by a Japanese man who reached the summit at 71 years old. Veteran adventurer Miura came to worldwide attention in 1970 when he became the first person to ski down Everest. High-octane endeavors are in his blood — his father Keizo skied down Mont Blanc at age 99. While I’m not suggesting we all aim to scale Everest, we can certainly aim for a small hill! See thejournal.ie for the full article. Join the IPC walkers Wednesday afternoon at 12noon as we step out around Dorchester! The more the merrier. Una from Positive Living Solutions joined us in the Cara Club this week. Una is a gerontologist from Co. Kerry. She specializes in creating safer homes; ensuring people can age in place in their home. Una gave us some great simple tips for making our homes safer. · Never wear slip on slippers – these are very dangerous regardless of your age. · Remove or tack down all scatter rugs. · Have sturdy rails for all stairs inside and outside the house. · Make sure that all stair cases have good lighting with switches at top and bottom. · If you have difficulty getting up after a long time sitting, place a hard cushion behind you back and underneath you to ease getting up. If you would like more information or tips from Una you can contact her on 617.876.1568. Please feel free to call Eileen at 617 265 5300 x 13 for more information on IPC Senior Citizen Outreach Program activities and services.